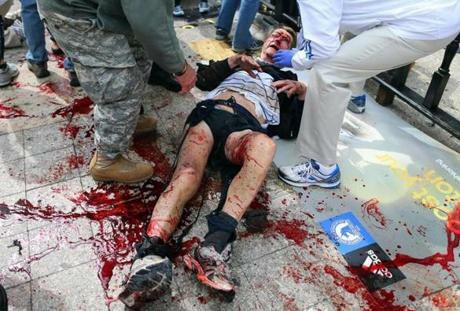 Chaos ensued at the finish line of the Boston Marathon when two bombs exploded on Monday afternoon, injuring dozens and killing several. 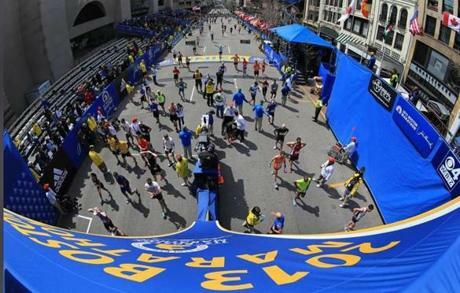 The day began as a beautiful, sun-filled, and joyful time as runners completed the 26.2-mile trek from Hopkinton to Boston. 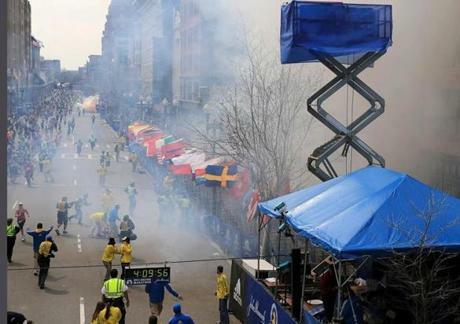 But the tenor of Marathon Day changed quickly when the first of two successive bombs exploded along Boylston Street just before 3 p.m.
A short time later, the once-joyous finish line scene had become a crime scene under lockdown. 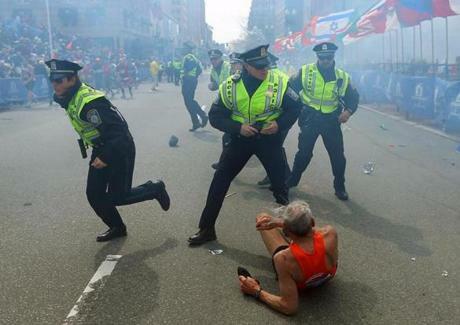 The jolt of the first blast knocked this runner to the ground and prompted police to spring into action. 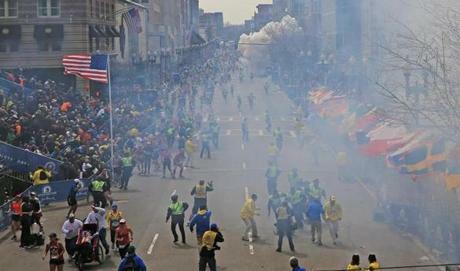 Seconds later, another explosion rocked the street several blocks away from the finish line. 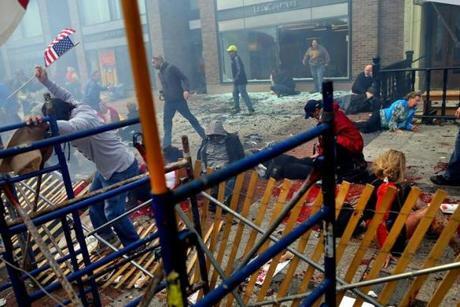 To reach the injured, bystanders had to tear down a makeshift fence that had been built for the marathon. 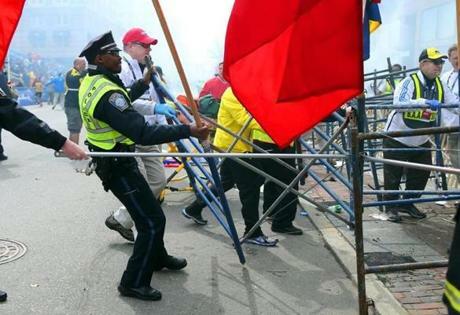 Police and marathon officials struggled to remove the barriers. 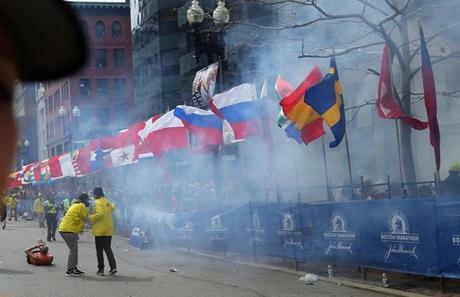 The blast created a smoky haze that contributed to the confusion that reigned in the ensuing minutes. 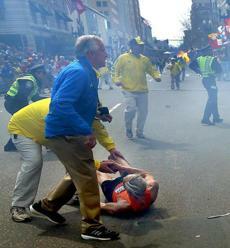 This man comforted one of the victims along the sidewalk. 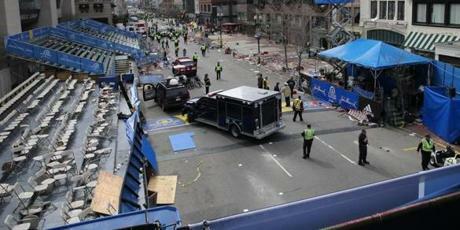 First responders sprang into action to help the injured people. 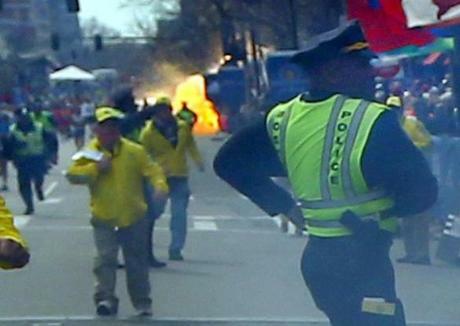 A marathon official helped the runner who was thrown to the ground by the initial blast. 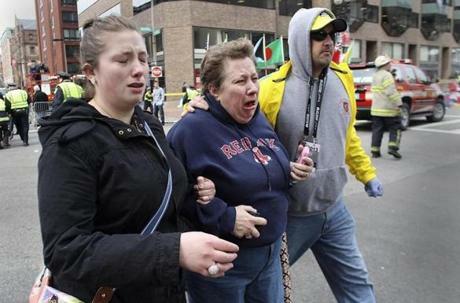 The scene along the sidewalk near the bombing was gruesome. 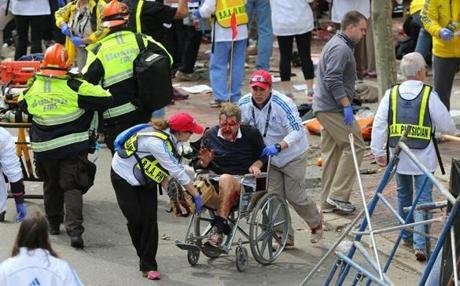 Wheelchairs that were on standby for runners who needed help at the finish line were put into use for those injured by the blasts. 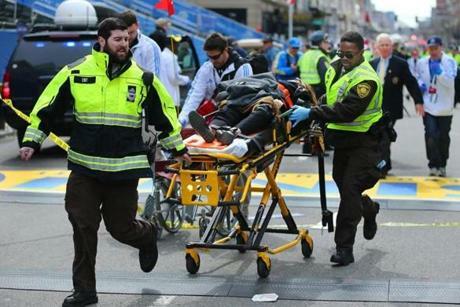 First responders wheeled away one of the injured on a stretcher. 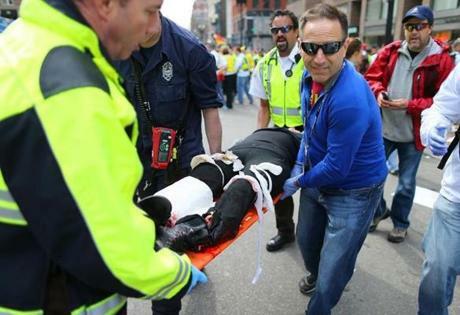 Another injured person was carried away by first responders. 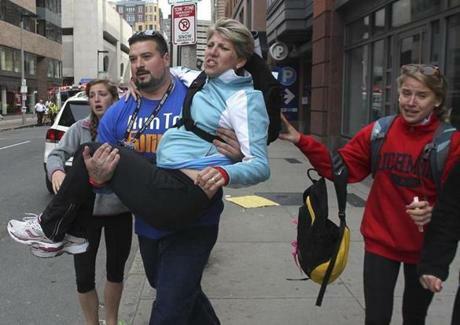 Former Patriots offensive lineman Joe Andruzzi carried an injured woman away from the scene. 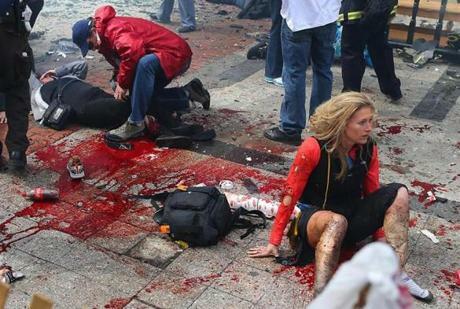 This woman dropped to her kneels in reflection after the blasts. 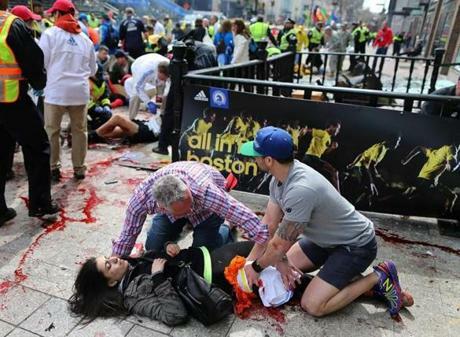 The blasts were traumatic for many at the scene, and caused people to flee the area. 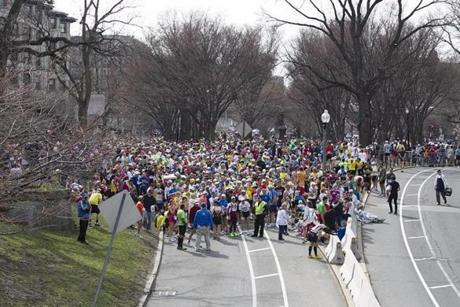 Runners who had not yet finished the race were stopped on Commonwealth Avenue. 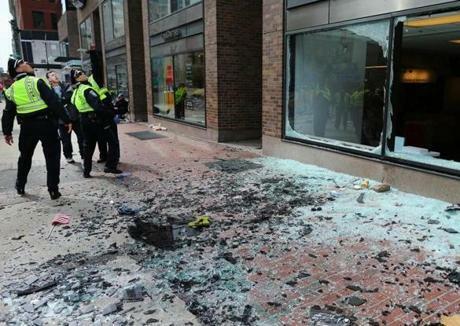 The blasts blew out windows and left a trail of debris along Boylston Street. 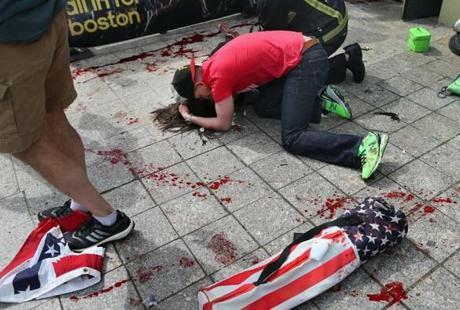 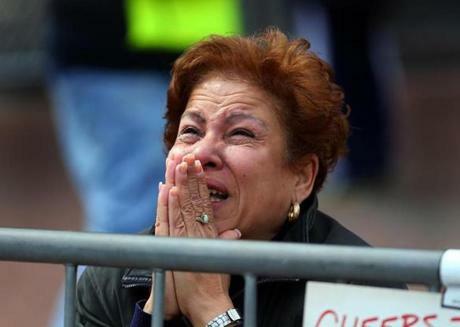 The blasts left an indelible image on the Boston Marathon, which will likely be forever changed by Monday's tragedy.